When you start planning your first visit to England you wonder how you will fit all the amazing things to see and do in London into one trip. Well worry no more, after several visits we have come up with what we think are some of the best things to see in the royal city. Most Aussies head to London on their first European trip. It’s the motherland after all 🙂 and I was no exception. For many years it seemed travelling via Heathrow was the only way to get to Europe so there were many stopovers. Because of this we have been lucky enough to spend over a month in London touring the fantastic museums and uncovering the history of this beautiful city. Below you will find a list of the places we still think about every time we reminisce about our holidays here. These are the places we tell our friends they cannot miss. We have also decided to share some of places that the guidebooks tend to put in the top 10 that we don’t feel are all that special. So let’s go – If you make it to the end of the page, I would love to know your favourite place. History lovers may already have this 1000-year-old building on their lists and for a good reason. The tower has many stories to tell. Anne Boleyn was beheaded here, the little princes disappeared, and the crown jewels are kept here under guard. On arrival take the free guided tour. The guides, known at Yeoman Warders, are fantastic, they are both entertaining and informative. 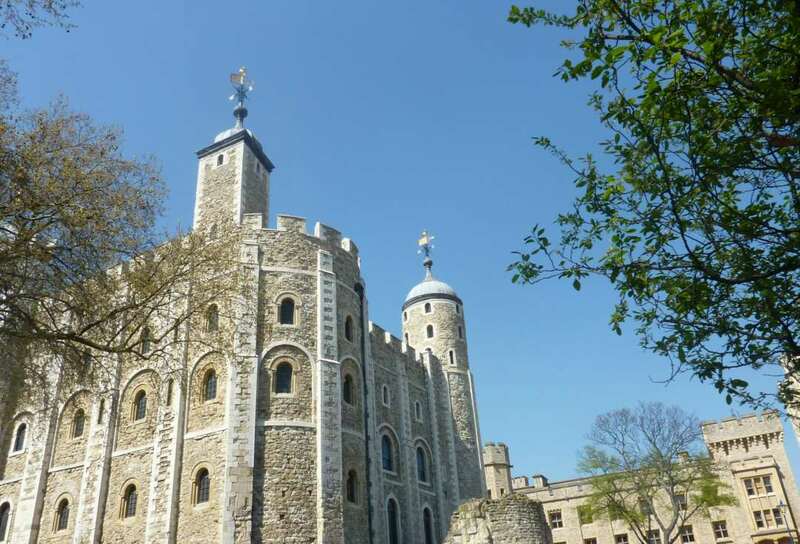 Highlights include the armour of Henry the 8th, the stunning crown jewels collection and Traitors Gate where prisoners were brought in via the Thames for beheading. Audio guides are available and recommended. Allow at least 2-3 hours for your visit. If you are travelling with kids they have some great free "Digital Missions" apps (for IOS only) guaranteed to get the kids into the idea of a visit here. The gift shop here is one of my favourite places to buy souvenirs, on one of our Christmas visits we got some beautiful jeweled Xmas decorations that still take pride of place on the tree each year and remind us of our London holiday. I suggest you buy tickets in advance if you are visiting in high season or on a tight timeline. The entry queue can be quite long. If you are on a tight budget, you can try to get one of the free tickets for the Ceremony of the Keys that is held each night at exactly 9.53 pm. You need to apply in advance. Cost: Adults £22.70 Kids £10.75 If prebooked. Walk up tickets a few £ more. Hampton Court is a Tudor Palace that was acquired by Henry VIII in the 1500s and his favourite of his 60 homes. All 6 of his wives lived for some time at Hampton Court, and each had a hand in its style. From April to August actors wander around bringing the daily activities of the occupants to life, and they take you along for the journey. 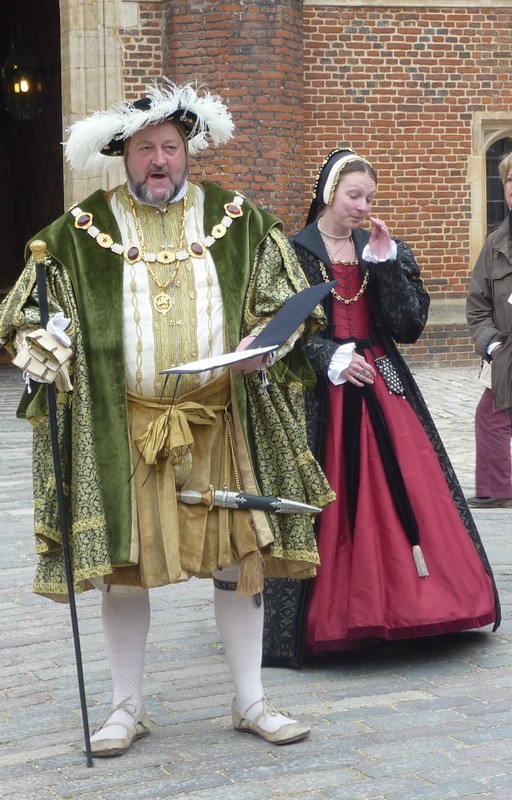 On the day we visited Henry was about to marry Catherine Parr, his last wife. We were able to help her prepare for her wedding by choosing her outfit and listen to Henry practice his wedding speech. For me one of the most fascinating parts of the visit was the Tudor kitchens, the audio tour of this area was excellent. So many words and cooking practices we have today seem to have come from this time. The gardens are also outstanding, like a mini Versailles. There are lots of ways to get to the palace, we took the train because we like to rough it 😉 and just bought skip the line tickets but there are really good organised tours from London like this bike tour if you prefer more structure. I highly recommend a visit here. Try to read or watch something about Henry VIII first to get the most out of it. Find out how to get to Hampton Court and the schedule of activities at Hampton Court. If you want to brush up on your British royal history check out the drama series The Tudors on Netflix. Henry the 8th probably did not look like Jonathan Rhys Meyers, but if you can get past this historical inaccuracy, this show is brilliant. 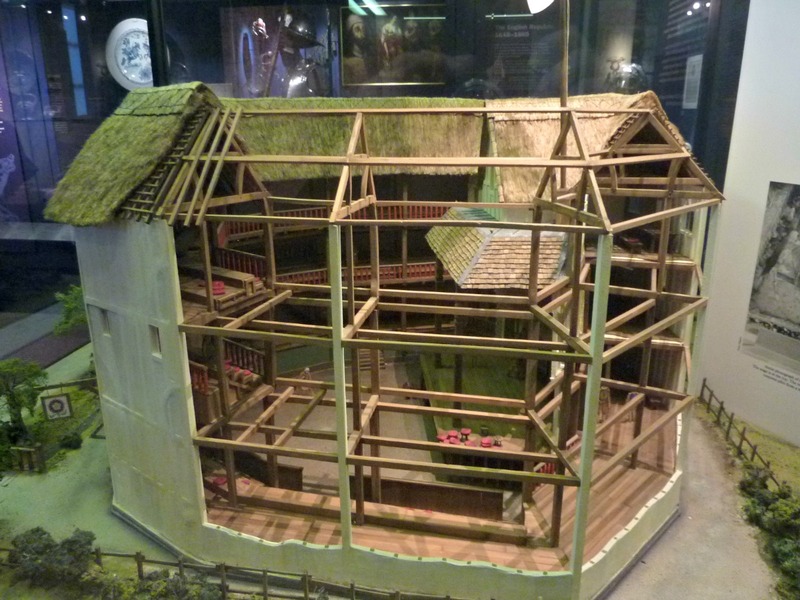 The re-creation of the original Globe Theatre sits just a few hundred metres from the site of the original. In the reconstruction, they used as many techniques as possible from the 16th century, and the design was put together using artworks and historical documents from the time. If the timing of your trip matches the Shakespeare season at the Globe, I would highly recommend you try to see a performance. We saw Macbeth in the 5-pound yard area (standing) right at the front of the stage. The yard was where the average person watched the performances in the 1700s. Did you know: The people in the standing yard paid they entrance fee into a box which is why theatres have box offices! 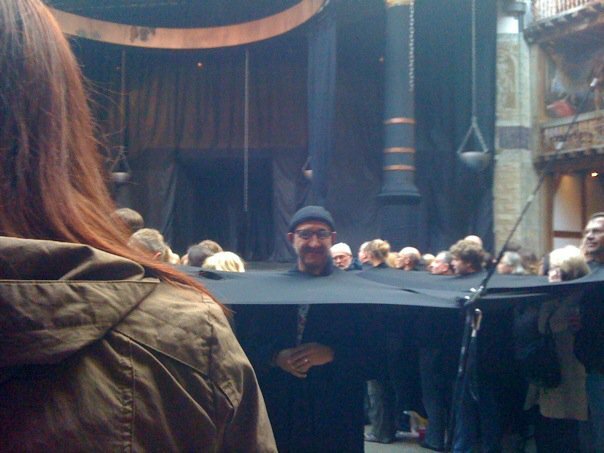 For this performance of Macbeth, they had covered the entire yard with a large black canvas in which they had cut holes. We stood with just our heading poking up through these holes for 2.5 hrs. We were part of the show, the underworld. The actors were running around our feet, and we felt part of it. We stood spellbound the whole time. Even our 12-year old enjoyed the play and seemed to understand it all. Fun but torture on the feet so make sure you wear comfortable shoes. Even if there are no performances I think the tour here is great for arts and history lovers. Cost: Yard (Standing) Tickets Are £5 . Most visitors to London schedule in a trip to the National Gallery in Trafalgar Square and rightly so as it houses some of the great masterpieces, but very few make it round the corner to the National Portrait Gallery. Over 11,000 portraits are housed with about 60% on display at any time. The highlights include the Tudors, including most of Henry’s wives, the Bronte sisters, Charles Dickens, Charles Darwin and Oscar Wilde. My favourite is a simple portrait of Emily Bronte painted by her brother Bramwell. I spent hours here and loved it. Seeing what all these faces from the past looked like was fascinating. The gallery is open until 9 pm on Thursday and Friday evenings, and even a 1-hour visit is worthwhile. Denis Sever house is art and history at once. Dennis Sever' House is part museum, part art installation and a unique experience that was one of my favourite things that I have done in London. The ten rooms in this three-story house are each designed in a different period and are presented as if lived in by inhabitants of different eras and circumstance. There are many rules here including remaining silent during your visit and booking in advance. We visited on the night candlelight tour, and I was mesmerised. While some visitors have expressed annoyance at the silence rule, I feel it only enhances your experience. I loved my visit, but you need to be prepared to use your own imagination to get the most of this place. To learn more about the house and decide if it is for you visit their website and read the full story. How: You need to pre-book so don’t leave this till the last minute. The Museum of London is a history lovers dream. This was my second visit to the museum which has undergone a huge renovation and I loved it even more this time. It is a fantastic stop for families and for anyone who wants to know more about the history of the city. The museum has nine galleries that trace London’s history from prehistoric times to 2012. The highlights for me were the London Burning installation that explores the Great Fire of London, the model of Shakespeare's Globe, the Victorian time’s gallery and some of the beautiful costumes. Entry is free, and it’s open every day from 10-6 pm. Check out the London museums website for more details. If you find yourself in London between Thursday and Saturday a trip to south-east London’s Borough market is a great stop for foodies. While not everything is bargain basement priced the food is amazing and well worth the cost. The market is one of the oldest and largest in the city and has plenty to offer everyone from the sweet-toothed to the cheese-fiend, especially the cheese fiend! So much cheese - don't miss Neal's Yard Dairy. Check out this article by food travel blogger Mark Weins on the best cheap eats at the market. Try to get here between 8 am and 10 am if you want to avoid crowds. Saturday is also a lot busier than the weekdays. There are chefs preparing food for you to taste and plenty of other activity. When: The full Market operates Wed-Sat between 10am-5pm (6pm on Fri). 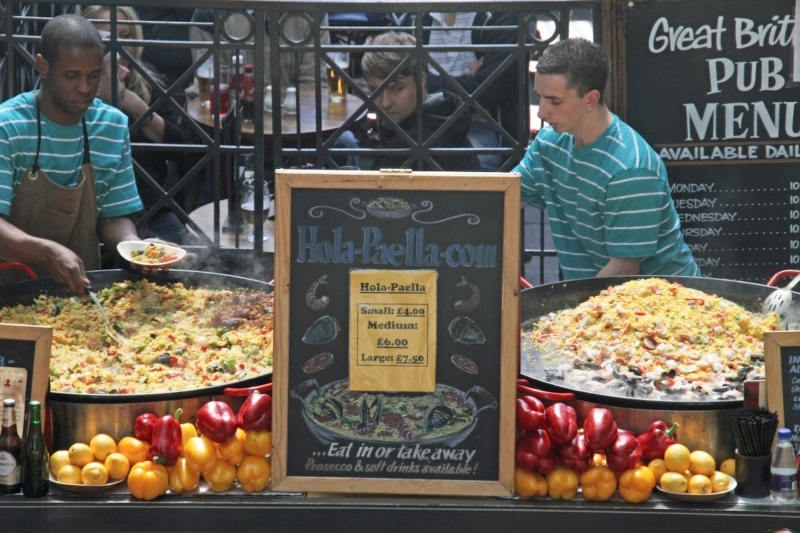 The market is closed on Sundays – partially open on Mon-Tues.
How: London Bridge station is right next door. The cute pub above was just a few minutes’ walk from our flat in Chelsea. On one visit we stayed in a vacation rental in Chelsea just off the King's Road, and there were several local pubs in walking distance. While we were disappointed that we could not get tickets to watch a football match we were lucky enough to be there on a Saturday that Chelsea won and scored five goals. The atmosphere was pretty amazing, and everyone was friendly. Watching a game at a pub with a pint and pie is an experience not to be missed. It won’t set you back more than a few pounds either. The cute pub above was just a few minutes’ walk from our flat. Sadly it is currently empty and awaiting orders about its fate. When: Early evening or during a big football game can be a fun way to meet some locals. 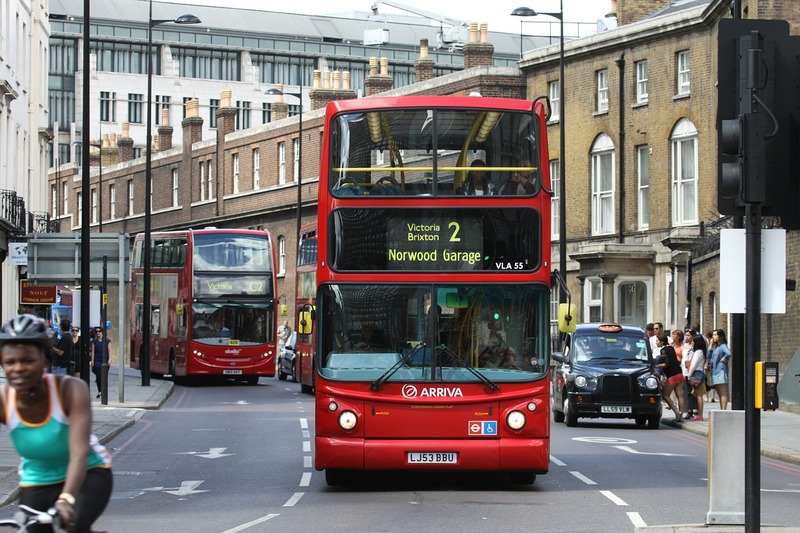 Riding a London bus is the quintessential London experience, and it must be done. So once you have chosen a route jump on the bus and head to the upstairs front seat for the best views. I suggest you stay clear of peak hour for a more relaxing experience. Route number 9 - Somerset House to Holland Park. This route will take you past Harrods, Kensington Palace, Knightsbridge, Hyde Park and the Royal Albert Hall. Route number 15 - From Trafalgar Square, past St Paul's Cathedral, Tower Bridge, Tower of London and on to Brick Lane. Route number 24 - Pimlico to Hampstead Heath. 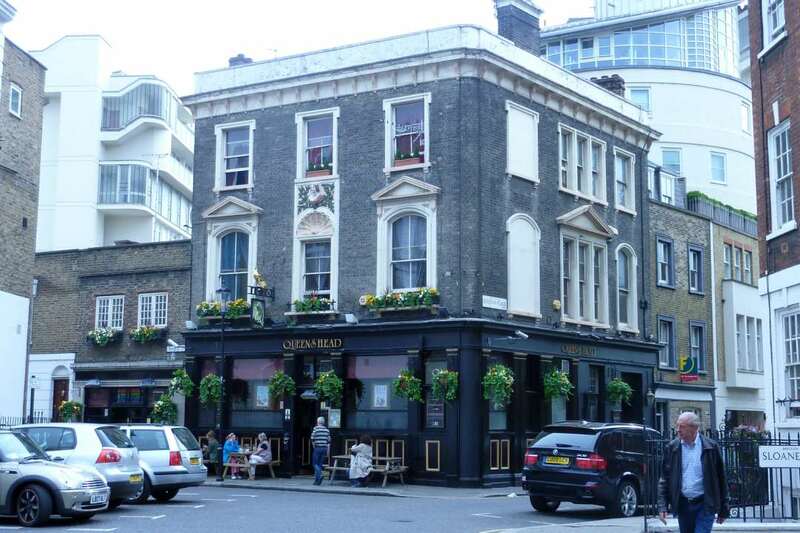 The oldest route in the city, join at Victoria from where the bus travels past Westminster Abbey, Parliament and Trafalgar Square before it heads to Camden, Chalk Farm and Hampstead. Every ride costs £1.50 regardless how the length. Just remember you cannot pay for your ride with cash. You will need to buy a Visitor Oyster card and then either load credit or a travel card. You can also use a regular Oyster card, but the visitor card includes discounts and can be purchased before you leave home. Plan your London travel with using the official bus maps here or this very cute map that covers the main tourist sites (PDF). Cost: £1.50 a ride with free transfers for 1 hour. One way to save money on your visit is to eat like a local. Grab a sandwich and sit in the park. We ate in parks at lunchtime most days, grabbing a takeaway (triangle) sandwich from one of the many shops that offer them. They cost a few pounds each and can be quite tasty. I liked the ones at Pret A Manger best. 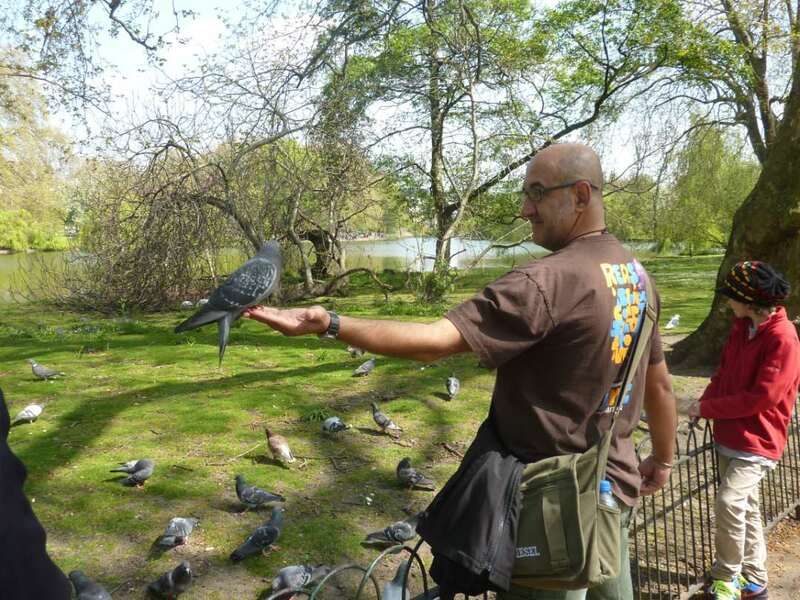 Hyde Park is the largest green space in the city and home to the Diana, Princess of Wales Memorial Fountain close to Kensington Palace and not far away from the Victoria and Albert Museum. St Jame's Park is the oldest royal park in the city and a sanctuary for ducks, geese and swans. 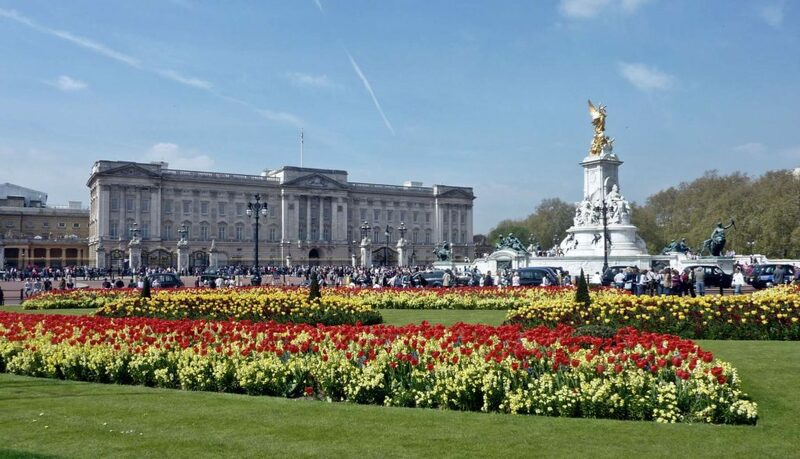 It's next to Buckingham Palace so you are unlikely to miss it. 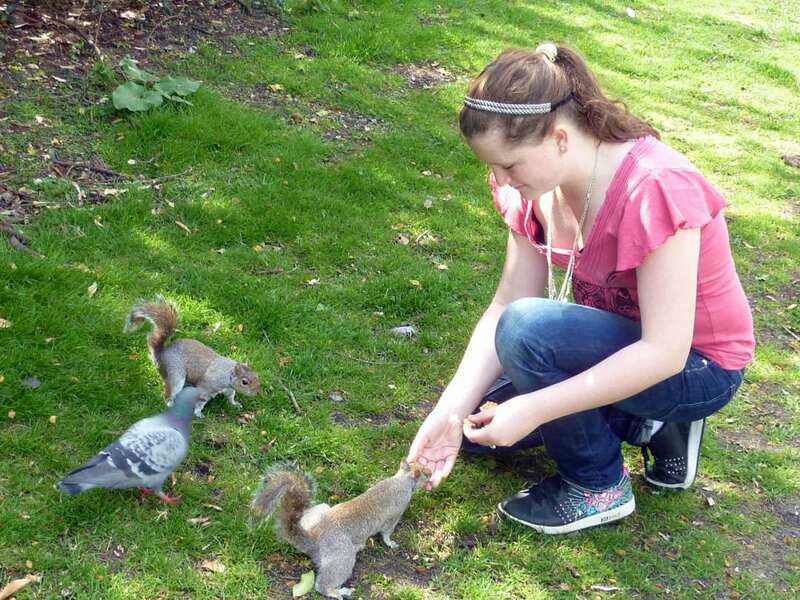 It is also home to lots of squirrels. The squirrels were not at all shy, and there were plenty about. It’s a beautiful place to get photos of the Palace and the London Eye from an interesting angle too. Some of our favourite parks were the little ones like the ones you seen in movies set in London. They seem like private gardens, and some are, but many are open to the public. They are all over the place, and I am sure you will discover your own. 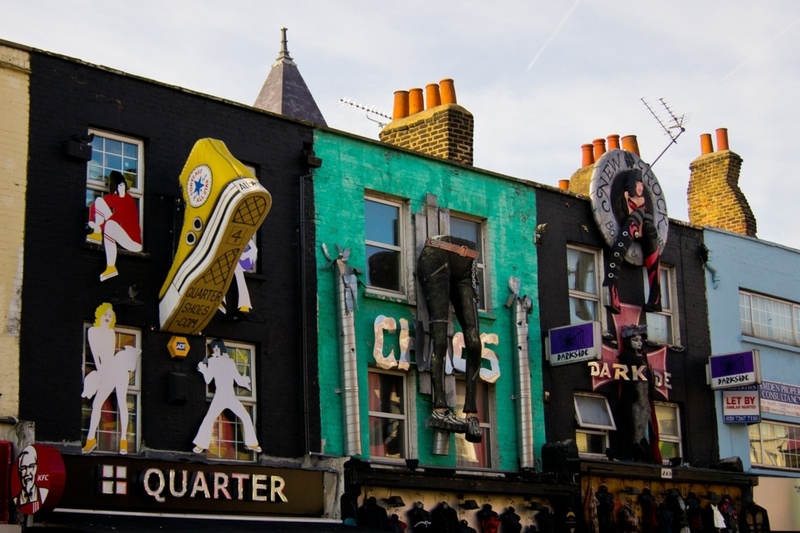 Since the 1970's when this was the epicentre of the London Punk scene Camden has always been a great place to head for a spot of people watching and it still is. It still has a strong musical focus with plenty of spots for live music and a statue of Amy Winehouse that is worth hunting down. When: It's quiet here in the mornings, the Markets open at 10 am but for the most atmosphere arrive mid afternoon. Combine your visit to this colourful little village with a stop at the Portobello Road Market (every day but Sunday) Off season try to visit on a Saturday to enjoy the buzzy atmosphere. 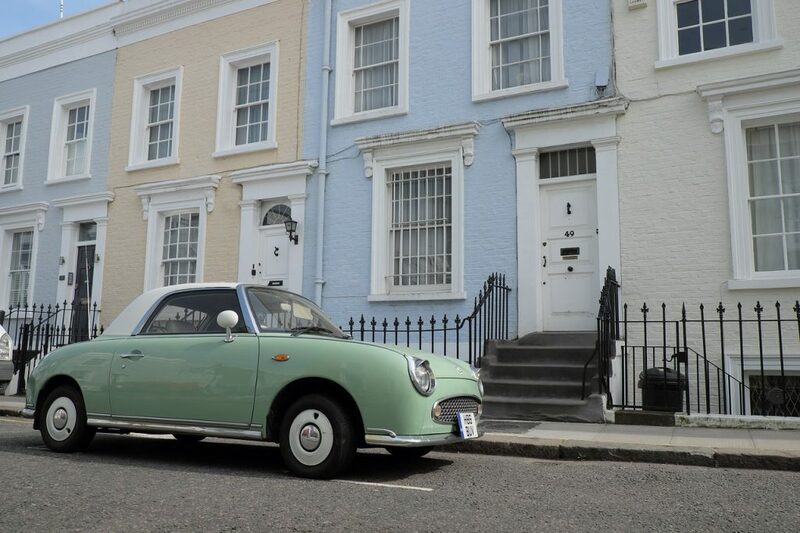 Notting Hill has always been popular but after the film of the same name was released in 1999 tourists began flocking here in even larger numbers. I made my first visit to this cute little area will colourful houses back in 1990 and loved it then. I was surprised to see how much it had changed on my most recent visit, the crowds for one have increased tenfold. If you want to see the locations from the film check out this self-guided walking tour by TripSavvy. We caught the bus from the city to the end of Portobello Road and walked the full street before veering off to the side streets. The market was in full swing and we ended up spending way more time here than planned as I had to pop into all the book shops, Lutyens & Rubinstein was a favourite and - you have been warned - do not enter Books for Cooks unless you have a big luggage allowance! For movie fans, the Travel Book shop where Hugh Grant worked is at 142 Portobello Road but it is based on the real Travel Bookshop at 13 Blenheim Crescent. Portobello Road - Keep your eye out for Alice's Antiques, George Orwell lived here for a year. Can you find the Blue commemorative plaque? If you are a fan of Yotam Ottolenghi (my favourite chef) you might want to check out his little cafe, it only seats a few but does great take-way to eat in the nearby parks. Prince Bonaparte Pub - This art deco style pub has great food and is a nice lunch spot. If you are travelling alone and fancy some company or just don't like the idea of tackling this without a guide there are a couple of great tour options you might like to consider. 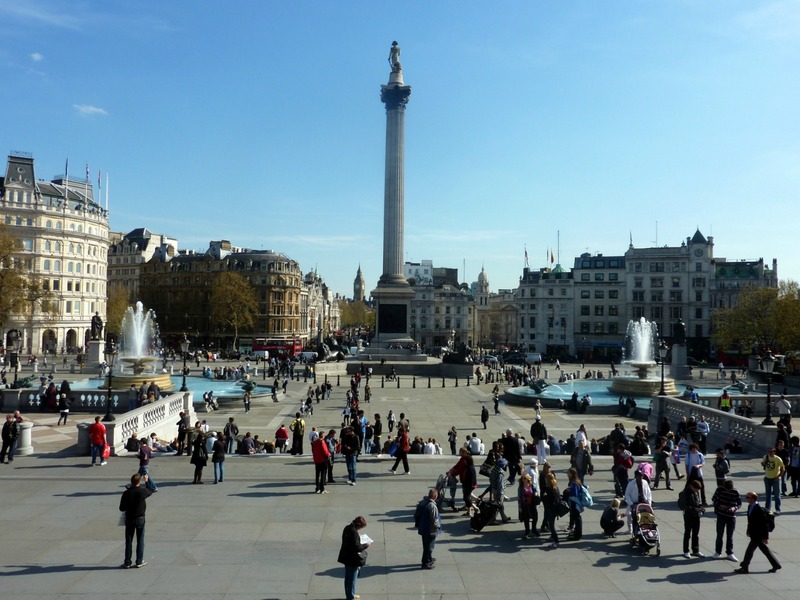 The Love Actually and Romantic Comedy Tour of London is a fun 3 hour tour perfect for girls weekends or movie buffs. 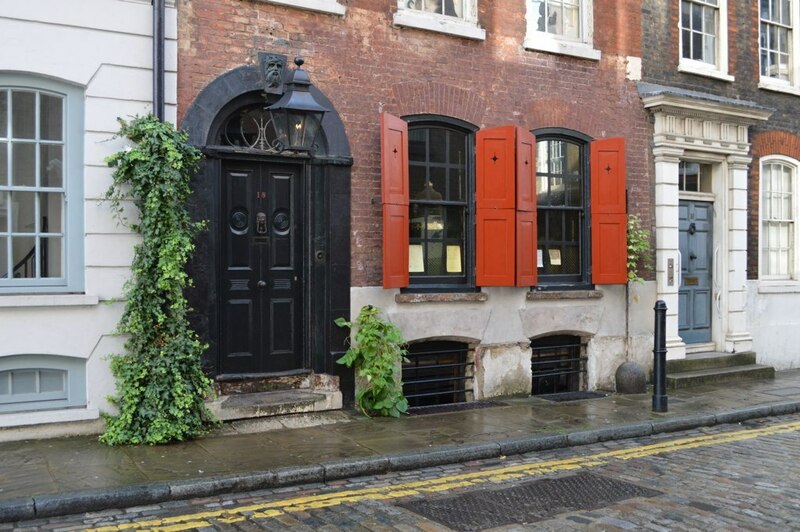 If you are more interest in Notting Hill generally then there is a 2 hour walking tour that will have you exploring with a local and finding hidden gems. Where: Take the bus (27, 28, 31, 52, 70, 94, 328) or tube to Notting Hill Gate on the Central, Circle and District Lines. When: Fri, Sat and Sun have the most atmosphere but any day is fine. Beat the crowds by arriving before 11am. If you are after photos earlier in the week is better. The London Eye - We did it last visit and were underwhelmed for the price but it's great for photos! The Hop on Hop Off bus - we were in London 10 days or more on our visits so did not really need this but it's great if you are short of time. London Dungeon - In all the local guide books but not our cup of tea. Brick Lane - just to eat! Have you been to London? What would you recommend? Got a question? Want to see more of our travels? Follow us on Facebook page.